Are you more interested in discovering solutions (BA) or delivering them (PM)? When working on a project, are you drawn to the requirements and details (BA) or the overall process leading to the end-goal (PM)? Business Analysts and Project Managers not only mutually benefit each other, they are both necessary for a well executed project. Together, all bases are covered. There is someone to look over the fine print, make sure every need is met (BA) and someone to see the whole ship stays on course (PM). 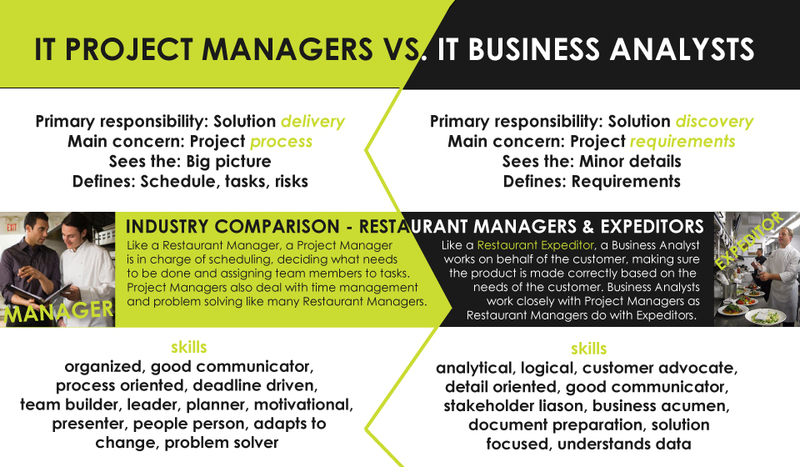 Because of the distinct characteristics of each role, many Project Managers decide they prefer the work of the Business Analyst better and vice versa. Take a look at the following infographic and see where you lean. Looking for a Project Manager or Business Analyst position? Check out our current openings!